Mumbai: The Bharatiya Janata Party (BJP) lost 180 seats that it won in 2013, and the Congress gained 162 across three state assemblies--Rajasthan, Madhya Pradesh (MP) and Chhattisgarh--as results were declared on December 11, 2018, according to an IndiaSpend analysis of electoral data. In 2013, the BJP won 377 seats and the Congress 118 in these three states. The BJP had no seats in Mizoram in 2013, and this is the first state election for Telangana, which was created in 2014. This means the BJP lost 48% of the seats it won in 2013, and the Congress gained 137%. The difference in vote share between the two parties in Rajasthan and MP, both heartland Hindi-speaking states, was much closer, as we will explain; Congress vote shares in Rajasthan, MP and Chhattisgarh rose by 6, 4, and 3 percentage points since 2013.
f 678 seats in MP, Rajasthan, Chhattisgarh, Telangana and Mizoram--which account for a sixth or 15.2% of India’s population--the Congress was ahead in 305 seats (304 wins and one lead), and the BJP had won 199 seats, as of 9am on December 12, 2018. Mizoram and Telangana were won by regional parties, the Telangana Rashtra Samithi (TRS) and the Mizo National Front, respectively. While the Congress won Chhattisgarh with 67 of 90 seats (from 39 in 2013) and Rajasthan by winning 99 of 199 (from 21 in 2013), MP went to the wire with the Congress on 114 (from 58 in 2013) and the BJP on 109 (from 165 in 2013). Rajasthan, it led by 0.5 percentage point. In Rajasthan, MP and Chhattisgarh, where more than 70% of the population lives in rural areas, farm distress appears to have played a significant role but not in Telangana, which is 61% rural and exhibits similar distress, as we reported on December 6, 2018. In Chhattisgarh, MP and Rajasthan, where 43%, 36%, and 30%, respectively, of seats are reserved for scheduled tribes and scheduled castes, except for Rajasthan, the BJP recorded its worst performance in a decade, while the Congress recorded its best. A strong wave of anti-incumbency swept through MP and Chhattisgarh--states where the BJP had been in power for 15 years since 2003--and Rajasthan, where no party has stayed in power for more than one term. In MP, the vote shares of the BJP and the Congress, were 41.2% and 41.3%, respectively. In 2013, the comparable vote shares were 45% and 36%. In Rajasthan, the BJP and Congress vote shares were 38.8% and 39.3%, respectively. In 2013, the BJP vote share was 45% and the Congress 33%. 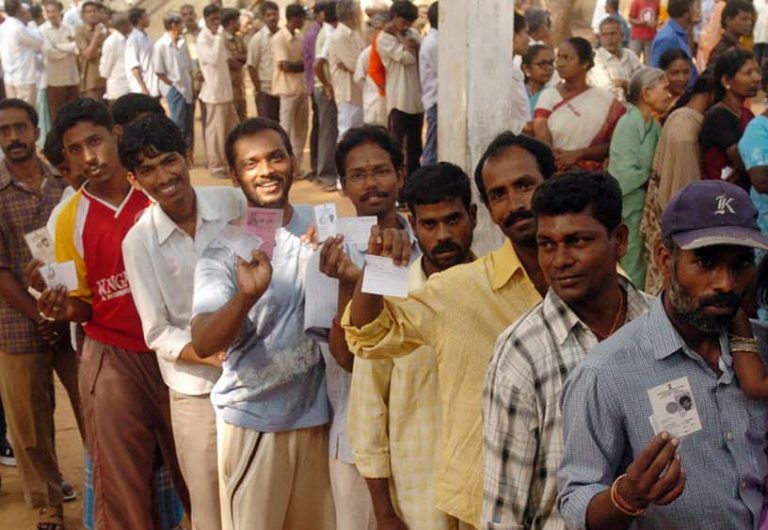 In Chhattisgarh, the BJP and Congress recorded vote shares of 32.9% and 43% respectively. In 2013, this was 41% for the BJP and 40% for the Congress. n November 29, 2018, over 100,000 farmers from across India marched to Delhi to demand a special session of parliament to address India’s farming crisis. Nearly 80% or 20.4 million people in the Chhattisgarh, 66% or 69 million in Rajasthan and 55% or 73 million in MP--the Indian average is 47%--are engaged in agriculture, indicating that farm distress may have played a significant role in electoral outcomes. Madhya Pradesh: Despite a 10.9% annual agricultural growth rate over eight years to 2015 (India’s highest), the state witnessed farmer agitations, IndiaSpend reported on November 30, 2018. As many as 1,321 farmers committed suicide in MP in 2016, the highest since 2013, according to government data. While farm suicides dropped 10% nationwide, MP witnessed a 21% increase two years to 2016.
f 230 seats polled for the MP assembly, the Congress won 114 seats, of which 79 seats were previously held by BJP, according to leads at 7.30 pm on December 11, 2018. Chhattisgarh: In a state considered to be India’s rice bowl, 1,344 farmers--519 a year or, more than one per day--committed suicide in Chhattisgarh over 30 months to October 30, 2017, the Hindu Business Line reported on December 21, 2017. As of 9am on December 12, 2018, the Congress had won 67 seats and was leading in one, of which 36 seats were previously held by the BJP, according to the latest election results. Rajasthan: As in MP, farmers in Rajasthan also complained about not being able to meet costs, although the government increased the price at which it bought the kharif (monsoon) and rabi (winter) harvests. Chief Minister Vasundhara Raje announced in February, 2018 that debts up to Rs 50,000 would be waived, but farmers demanded a full waiver, which the Congress promised. f 199 seats in the Rajasthan assembly, the Congress had won 99 seats. Of this, 75 seats were previously held by the BJP. Telangana: In the four-and-a-half years since it won statehood, Telangana reported acute farm distress, with 2,190 farmers committing suicide--more than one every day--according to data from the state government’s police department, IndiaSpend reported on December 6, 2018.
ver 89% of rural agrarian households in Telangana are in debt--the Indian average is 52%--the second highest proportion in India after Andhra Pradesh, according to the Telangana Social Development Report published by the state government. Yet, the TRS won 88 (48%) of 119 seats, surpassing the 60 required for a majority. Chief minister K. Chandrashekar Rao, who has been in power since the state’s formation in 2014, will return for a second term. Across Chhattisgarh, MP and Rajasthan, the BJP lost 57 or 34% of 170 seats reserved for scheduled castes, or dalits, and scheduled tribes. In Chhattisgarh, where 31% of the population is Adivasi, or from scheduled tribes--the highest concentration among India’s large states--the BJP’s popularity in 29 tribal-dominated constituencies further dwindled from 2013. Seats for scheduled castes (13% of the population) and scheduled tribes together account for 43% of the state assembly’s 90 seats. As of 7 pm on December 11, 2018, the incumbent party--in power for 15 years to 2018, with Raman Singh the party’s longest-running chief minister--was leading in eight reserved seats (28%), three fewer than in 2013 when it had won 11. In 2008, the BJP had won 19 scheduled-tribe seats. In contrast, the Congress retained its lead over 18 seats, equalling the number it had won in 2013 and increasing by eight the seats it won in 2008. In an indication of tribal disaffection against incumbent MLAs, in 12 of 29 seats reserved for STs in Chhattisgarh, BJP lost eight and the Congress lost four seats. Janata Congress Chhattisgarh won one seat. The BJP failed to retain its hold over Chhattisgarh’s assembly constituencies reserved for scheduled castes. Of 10 seats reserved for scheduled castes, the party was leading in two, down from nine it had won in 2013, latest results showed. The Congress was leading in seven, up one from 2013. These election results echo our findings from travelling across India’s tribal heartland in November 2018. The state’s failure to settle forest land claims led to tension roiling in tribal dominated areas, IndiaSpend reported on November 20, 2018, and this was reflected in the performance of incumbents in scheduled-tribe constituencies. Of 887,665 title claims, Chhattisgarh’s government issued 416,359 titles across 2.7 million acres, which is 7.8% of the state’s area or 18% of its forest area, according to our analysis of title data. Experts further believe nearly half the tribal population has not even demanded their rights yet. Community forest rights--central to the agency of Adivasi tribes, as they recognise the authority of the gram sabha (village council) to protect, manage and conserve traditional forests--account for 4.4% or 18,178 of the titles distributed. In MP, where tribals account for 21% of the population and scheduled castes 16%, the BJP recorded its worst performance in these constituencies, losing 25 of 82 reserved seats, or 36% of assembly seats. The Congress gained 26 scheduled caste and scheduled tribe seats over 2013, its best performance in a decade. As of 7 pm on December 11, 2018, the BJP was leading in 21 of 47 seats reserved for STs, losing its hold over 10 seats from 2013, when it had won 31. In 2008, the BJP had won 29 seats. The Congress has won 23 seats--after winning 15 seats in 2013, and 17 in 2008. Of 35 seats reserved for scheduled castes, the BJP won 13 seats, 15 down from the 28 it had won in 2013 and 25 in 2008. The Congress won 22 of these seats, up from four in 2013 and nine in 2008. In Rajasthan, 59 seats or 30% of 200 assembly seats, are reserved for scheduled castes and scheduled tribes. Among 34 scheduled-caste seats, the BJP won 14, down 18 from 2013, when it won 32 seats, highest in a decade. In 2008, it won 14 of these seats. After losing all seats reserved for scheduled castes in 2013, the Congress won 18 in 2018, equalling its 2008 performance. Of 25 seats reserved for Adivasis, as of 7 pm on December 11, 2018, the BJP was leading in 12 constituencies, the Congress in 11. The BJP is down six seats over the previous election, when it won 18 scheduled-tribe seats. In 2013, the Congress won four seats reserved for Adivasis. In Kerala as the Left and Congress battle it out, will the BJP stand to gain?